Saturday 14th September saw the next event in our series of discussions "Open Talk about AIR" connecting Youkobo with artist in residencies around the world and through their artists and directors learning more directly about their programs, while talking frankly about their successes and challenges. 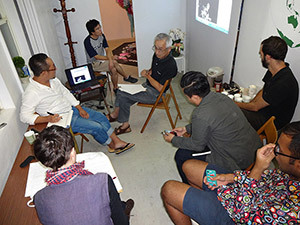 On this occasion Youkobo's staff and residence artists Ade, Kai and Arnaud, along with Kyougo Matusmoto, joined the Serbian based residency "EARP" with artist in residence Mariko Hori and director Veselinka Beba Mclarnon. EARP is located 1 hour from Belgrade in the area of Erdevik, a rural village which until 3 years ago had very little contact with experimental contemporary arts. Set in an idyllic environment of fields and gardens, this residence, as Hori puts it, "is a way of life", and is designed to engage not only art but also everything from agriculture to philosophy.With a capacity to host 4 artists at any one time, and with villagers popping through on a daily basis EARP is a place of encounters. It is designed to bring people together in collaboration and in this way is not merely restricted to the visual arts, but also encompasses music, dance, performance, poetry and writing, hoping to encourage cross fertilization between different modes of expression. Artists who come to EARP are met with a rich environment to respond to and using local materials they most frequently develop site specific work which reflects the context of their surroundings. The residency also holds regular workshops with local children and encourages the development of the local arts curriculum, while artists themselves are pushed to more critically address their practice through constructive debate and dialogue. EARP also pursues a strong interest in permaculture, cultivating its own garden and small farm and provides a platform from which to discover about food, customs and people, "it is all about living, it is about how to be as a human" says Beba.Through the skype session both EARP and Youkobo shared their different models of AIR, finding both similarities and differences, and analyzing their successes and current weaknesses while looking towards their future vision. All of the staff and artists were most impressed and are already busy writing their applications for next year I believe.